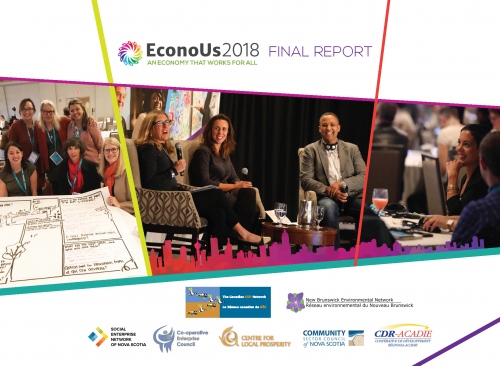 From September 24-26, 2018, over 350 leaders from across Canada’s social innovation landscape gathered in Moncton, New Brunswick, for EconoUs2018. Since 2001, CCEDNet has partnered with members across the country to showcase the amazing work being done in different regions, to raise awareness of the impact of community economic development (CED), to examine new ideas, resources and strategies that will make CED practitioners more effective in their efforts, and to connect people who share similar values and vision. As a collaborative initiative, a committee of local planning partners came together to co-host the conference. The New Brunswick Environmental Network was the local host, with support from the the Co-operative Enterprise Council of New Brunswick, the Centre for Local Prosperity, the Community Sector Council of Nova Scotia, the Coopérative de développement régional-Acadie, and the Social Enterprise Network of Nova Scotia. This approach fostered a diversity of perspectives in the conference program, highlighted the local character of the host community, and ensured that a positive legacy of strengthened capacity was left in the Maritimes. 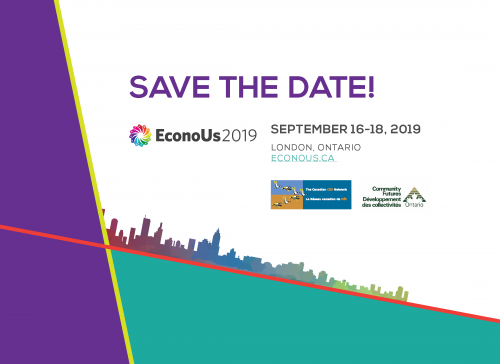 Next year, EconoUs2019 will be our biggest yet, in London, Ontario, hosted by Community Futures Ontario. Join us to celebrate CCEDNet's 20th anniversary and continue growing an economy that works for all. See you there!